Providing high resistance against concentrated acids and bases, the Ansell AlphaTec 85-303 CSM Heavyweight Isolator Box Gauntlet Gloves are ideal for protecting hands in pharmaceutical environments. They also withstand temperatures of up to 120°C, feature an increased thickness of 6mm for added durability, and are white in colour for easy detection of contamination. The product code for the gauntlet gloves is: 85-303. Working with acids can be exceptionally dangerous, but at the same time you don't want to wear gloves that are going to restrict your ability to work safely and efficiently. The 85-303 gloves are highly resistant to concentrated acids and bases, while also being soft and flexible enough for ease of use. They also with stand temperatures up to 120°C, and resist ageing from exposure to oxygen, UV rays, and ozone, ensuring quality protection for longer. The Ansell AlphaTec 85-303 Gauntlets are available in a choice of sizes, making them suitable for most users. Please consult the table below for details, then select the required size from the drop-down menu at the top of the page. The gauntlet gloves have a thickness of 0.6mm and a length of 800mm (port size 250mm). Please note that to ensure the highest level of quality for our customers, the Ansell AlphaTec 85-303 CSM Heavyweight Isolator Box Gauntlet Gloves are not suitable for return. 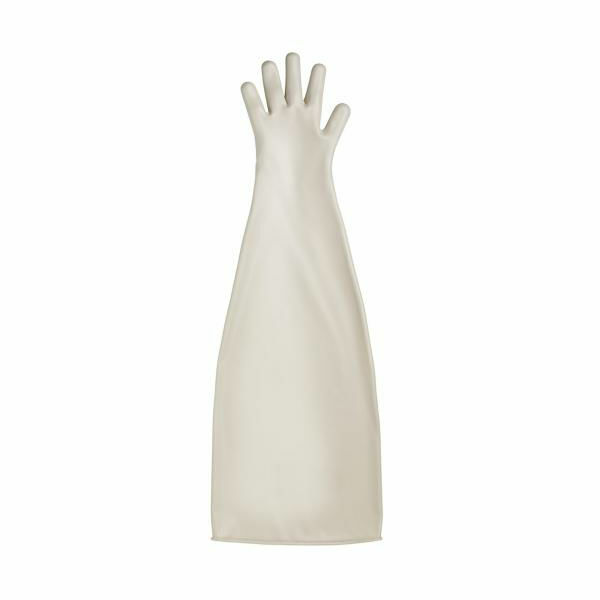 If you are unsure about the suitability of these gloves for your purpose, please check with our customer care team on 020 7501 1104 prior to purchase.